Consolidation, cutbacks and competition from the web — these are the headlines grabbing the attention of business journalists around the world. Concerns about the quality of reporting and information have risen steadily as the industry has undergone dramatic changes, and it seems there is no end in sight. How has global expansion affected the standards of news organizations? What impact have blogs and “citizen journalism” had on the industry? And what role — if any — does labor-intensive investigative journalism have in an age of around-the-clock cable news updates and shrinking budgets? To answer these and other questions, Knowledge@Wharton spoke with four participants from the 2007 Wharton Seminars for Business Journalists: Renita Jablonski, a producer for American Public Media’s “Marketplace”; Indira Kannan, U.S. bureau chief for CNBC-TV18 and CNN-IBN in India; Richard Perez-Pena, a reporter with The New York Times; and David Barroux, U.S. bureau chief for French business daily Les Echos. An edited transcription of the conversation follows. Knowledge@Wharton: The whole area of covering business is changing. As an example, there were three stories in The New York Times today regarding journalism: First, the kickoff of the Fox Business Network, which is going head-to-head with CNBC; second, the creation of a new journalism venture started by Paul Steiger (formerly with The Wall Street Journal) and composed of investigative journalists who will give away their work to media outlets; and third, the BBC’s move toward digital TV as a way to adapt to the digital era at the same time that it is being forced to make sizeable job cuts to bring its budget into line. So, it looks like there’s lots of consolidation, cutbacks and new competition. Should we be concerned about the quality of business news these days? Jablonski: Maybe we could start with the new Fox channel. Prior to that becoming more publicized, you were seeing the subtle changes in its main competition — the flashier graphics, and maybe a pace that was slightly different. I think that Rupert Murdoch and company recently revealed that, in fact, they are going to be aiming more for the consumer. While there are more options [for consumers], you need to be really educated about what each outlet is providing you, the background of the company and its affiliation side. I find that the way they are trying to position themselves differently is really interesting from the get-go. Kannan: I’ll talk from the perspective of what CNBC does in India. It is a 24-hour channel in English, but we also have the Indian-language counterpart in Hindi, which is called CNBC Awaaz. They do address different audiences. CNBC-TV18, which is the English-language channel, looks very aggressively at an urban, upwardly mobile, up-market kind of an audience, whereas CNBC Awaaz probably has been doing what Fox Business News now says it will do — it’s targeted more towards Main Street rather than Wall Street. CNBC Awaaz is really directed at a whole lot of retail investors, people in small towns — maybe even housewives who are sitting at home, who want to get into investing and do a lot of day trading. So, in India, we already have these two very distinct segments which are being served by both channels. Perez-Pena: Obviously, there are more sources of information than ever. It has been a proliferation especially on the web, and at the same time the traditional media have fewer and fewer resources to work with. I think while there is a democratization of information, and more people have access to more information, there also has been a fragmenting of the audience, so there is a lot of information that doesn’t reach certain people. And while the universe may be wider, it is not necessarily deeper, because the resources to do really in-depth work — investigative work — are harder and harder to find, which is what Paul Steiger’s new venture is intended to address. So it is changing, and I think in some ways for the better and some ways for the worse. Barroux: [In the French media], we realize that the challenge we are facing today is that we have to be able to talk to many more types of audiences than we used to talk to. In the past, we talked to people who knew what we are talking about. Today, we have to be able to talk to people who want to learn more about the economy. We also have to learn how to use the different types of medium for the different types of people we want to reach. It is a challenge, but it also could be an opportunity. For example, in France, less and less people are reading daily newspapers, and the younger generation just goes on the web. We have to learn how to be able to talk to the younger generation using the web, and if we can succeed, it will be a good thing for us because we will be able to reach that audience. Knowledge@Wharton: I wonder if I could ask everyone to weigh in on that point more broadly: Where do you see people getting their business news these days? Are some channels — like newspapers — diminishing in importance, and where do you see growth coming from? Perez-Pena: Well, one of the things I find sort of extraordinary is looking at the web traffic numbers from Nielsen and other sources. I think the largest source of financial information, just by the sheer number of people looking, is Yahoo! Finance. People know how to go and get data on their own; they don’t need it spoon-fed to them by the mainstream media anymore. In fact, most of the mainstream media are retreating from even providing it. Stock tables are gone, just like in a lot of newspapers the baseball box scores are going away. People have other ways of getting that. There are so many sources on the web — you know, MarketWatch and all the others. I think that is increasingly where people are going. The mainstream media still attract huge audiences, but [they are] shrinking. Kannan: I think it is a similar case in India — probably slightly different because in India, as you know, the media market itself is exploding at present. There is tremendous growth not just in television and Internet, but even in newspapers. We just recently had a fairly new newspaper launch, which is Mint. It is a fairly new development and probably not very characteristic of a lot of other markets where you still have new newspapers coming up. The Internet traffic is also growing. Our media group, for instance, has a financial site called moneycontrol.com. It is supposed to be the number-one financial portal in all of Asia. So, clearly there is huge traffic that is going online. And I think it is going to be increasingly important not just to find ways to put the information online: In India is, not only are people going onto the Internet, but increasingly they are doing it via mobile sources. It is going to be even more important for us to create content that they can actually carry. Jablonski: It is not necessarily where the information is coming from but how it is being consumed. Certainly, people are going to The New York Times, The Wall Street Journal. It is interesting to see how overseas media is becoming more looked at, [such as] the Financial Times — people, I think, are consuming that via the web at a higher level, just searching for as many perspectives as possible. And all of that is just a click away in Bloomberg and other more traditional business sources. And then, at the same time, there is trying to set yourself apart and the lack of resources. When I’m covering something like the recent issues with Goodyear, usually I would run out with my tape recorder and microphone and try to spend as much time as possible with the workers, getting the company on the phone — just a couple of years ago, that’s where the focus was. Now, I am balancing the digital camera and trying to ask a few more questions for what might be a web extra. It is strange, because I sometimes wondered if I wasn’t losing the heart of what was going on because I was so concerned about capturing these other aspects. Jablonski: That’s a good way to put it. Barroux: Coming from a business newspaper, we used to have very limited competition in France. For example, there was just one other newspaper. It was difficult to set up a new newspaper; you had to have a printing office and all of that. What we realize today is, with the Internet — as Richard was saying — everybody in a sense can become a financial and business newspaper. So, we realized that there is much more competition. Even though we claim that the quality of what we produce is higher than what you could find for free on the web, it’s becoming very, very difficult to make people pay. We are one of the very few web sites in France that are actually asking people to pay for content. One of the biggest challenges in the near future will be to make sure that people are willing to still pay for something before really seeing what it is, because they think that the free content will be enough. It’s difficult to find a way to justify the premium, in a sense. Knowledge@Wharton: Business news used to be pretty stodgy. It’s not so any longer, and I’m wondering, what’s the difference? It could be that there’s more breathtaking corruption these days. It could be that business is seen as more glamorous, and there are more colorful personalities. What’s the difference? Why is business news so popular? Jablonski: I think this is really the other competition that’s coming up as a theme. Certainly, globalization is bringing many more connections to the forefront than ever before. Earlier, if you were looking at certain overseas stories, you always had to sit down with the rest of your editorial team and think, “All right, so what’s happening in the U.S. or in a nearby town that maybe mirrors this situation so we can make that relevant?” Whereas now, there are sort of instantaneous connections. The way a market moves overseas is going to be directly correlated to what we’re seeing on Wall Street — and certainly the current subprime meltdown, unfortunately, displayed that pretty heavily. Perez-Pena: In [the U.S.], at least, there has been this profound cultural shift over the last 20 years or so that people understand that it affects them, and it affects them much more directly than it used to. In 1980, if you’d asked the average American, “How are you influenced by what happens in the financial markets?” you would have gotten a blank stare. Most people weren’t invested in the financial markets, and they didn’t know how it touched them. Now, virtually everybody is, and they do have some understanding, however rudimentary, of how it does affect them. There’s also just more of an understanding of the interconnectedness of everything, so I think that definitely pumps up the audience. But in terms [of] the glamour and the liveliness of the coverage, I think that’s happening to the media generally, not just business reporting. I think everybody understands that you’ve got to grab people. Everyone’s in a hurry, they have a hundred other sources they could go to. Kannan: As far as business journalism in India getting a little bit more colorful and glamorous is concerned, it’s just because of the sheer explosion in the number of business personalities in India, especially in the last decade or so after economic liberalization really picked up. We’ve seen this explosion in enterprise and the new number of companies that are coming up, and the booming stock market, which has really raced up in the last few months. There’s just more personalities to cover, and as the number of business channels increases, I think one of the reasons is the competitiveness. This is something that we would never have thought of two or three years ago, but CEOs are just such huge personalities, and because the base of retail investors in India has expanded so dramatically in the last few years, they’re far better known in public life, among the Indian public as well. Barroux: Just as a follow-up comment: It’s true, I think, that journalists themselves have changed and know that they have to grab the attention of the public. But the CEOs also have totally changed. If you look at the typical CEO 20 or 25 years ago, his life was much more quiet than it is today. Today, they are like stars in a sense, so they try to manage the news, but they also try to show you their life, and they have also become much more personal. The reporter and the CEO both see that the world has changed, and so there’s a new way to cover people who have changed. Knowledge@Wharton: Let’s take a somewhat different tack. There has recently been the emergence of what we call “citizen journalism,” with the rise of blogs and the whole blogosphere. Is that affecting business journalism, and if so, how is it affecting each of your organizations? Barroux: It is, because everybody, to their ability, can be an expert, and I think maybe we’re in a transitional period where we are seeing this explosion of blogs. But if you look deeper — and as reporters, we have to look into the details of many stories — you realize that many blogs keep on saying the same [things]. They repeat themselves. And maybe one of the future outcomes could be for people like us to just build on our brand and say we can help readers get to the relevant information. Our future job may be to try to know which blogs give the best information, and we will have to bring that to the public. We can be some kind of a filter, which we do today. We have to learn how to be the filter in a new environment where there is much too much news available and the readers’ time is precious. It’s new so it’s fun, but I guess [readers] will want us to play that role again in the future. Jablonski: You’re going to approach certain business stories pretty traditionally, waiting for confirmation on something and trying to reach out to your sources to get something confirmed. 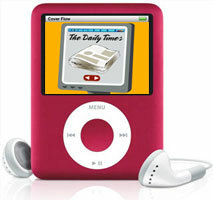 What’s been fascinating to me recently was the last big Apple meeting in San Francisco where Steve Jobs was announcing these new iPods; this was on our radar, and all you really had to go on was all these techie blogs. They had been following this so intensely — “The last time this sort of vibe was put out, this happened, so…” — [offering] details that people reading traditional media wouldn’t otherwise pick up on. More and more now we’ve got an eye on it, because obviously something’s going to happen. It was just interesting to cull so much of that [coverage] from people offering these blogs, and really following something in a way that we wouldn’t be able to [otherwise]. It definitely comes into play. Kannan: I think nowadays, pretty much all reporters are expected to blog about their own experiences and reports. I haven’t gotten into that, but, you know, coverage of blogs and anything technical, for that matter, is pretty much part of mainstream business news now, at least in India. We have a tech show back in India on CNBC, and when the iPhone came out in the U.S., they got me to buy the iPhone, even though it would never work in India, activate it and get an AT&T connection, put it on international roaming and ship it to India, so that they could use it there and review it. I mean, there is such tremendous interest in a whole lot of new technology and new gadgets back there. Knowledge@Wharton: We’ve mentioned Paul Steiger’s new investigative initiative. Do you think it will be successful, and is there a place these days in the budget for investigative reporting? Perez-Pena: Well, the budget is the one thing he doesn’t have to worry about because he’s gotten a lot of money from some very wealthy people. They’ve pledged $10 million a year; I don’t know of any news organization anywhere in the United States that has as many dedicated people, and as big a dedicated budget for investigations as what he’s going to be working with. So, the resources are tremendous. So, in terms whether it will be successful financially, it’s something they don’t have to worry about. The question is, where will the material be placed? What kind of cooperation will they get from mainstream media? Obviously, there’s a real reluctance to using other people’s product. At The New York Times, I know that there would be a lot of vetting that would go on, or an insistence on being involved early in the project, and doing it collaboratively. So those are things they’ll need to work out as they go along, but I actually have a pretty high degree of confidence in what they’re doing and in its ultimate success. Jablonski: I’m just throwing this out for feedback: I would think now is an interesting time for this venture to come up, because of the shift in ownership of Dow Jones and some of the concerns as far as whether a certain level of investigative journalism that The Wall Street Journal has been known for is going to continue. This emergence is particularly interesting…. Perez-Pena: And it’ll be interesting to see how many Journal people they hire. Barroux: What we don’t really know is [whether] there [will be] changes only in investigative types of journalism. For a business newspaper, we used to be very vertically integrated. We would produce the news, print the newspaper, sell the news. In a few years, maybe we’ll become specialists in writing about financial and business news, but maybe we will find other newspapers that would be willing to buy this content from us for their own websites. There might be a change in the business model. You might imagine that The Wall Street Journal could start to have specific content about companies that they would resell to local newspapers who want to be able to differentiate themselves from their competition. We might have to think about [how to do things in] a different way, to monetize the content that we are creating today. Jablonski: Just to add … how quickly something like an investigative report — or maybe something that is a little more obvious, that perhaps gets a big headline — how quickly that affects what is actually happening in the business world, because of how fast information is dispersed: It’s really a different world than it was just a few years ago. Knowledge@Wharton: Across the world, you find media organizations are growing globally. What is that doing to standards of journalism? For example, do you find journalism from some areas to be suspect, because of things like government censorship, and so on? How do your organizations manage these standards? Kannan: In India, at least, investigative journalism is pretty much all the rage now — especially in television, with these sting and undercover operations. In fact, we had a recent case where because of the intense competition among various channels — I mean everybody is in a race to produce a more sensational and a more exclusive story — and we had a case recently of a fake sting operation where a channel just came up to frame somebody, allegedly, just to get an exclusive story. There’s a huge debate now going on also about a broadcast bill in India, which a lot of broadcasters are concerned gives the government way too much control over the media. We haven’t had that kind of undercover sting operations in mainstream business journalism, but there are a lot of concerns about how responsible and how careful journalists need to be. Especially now with the stock market sort of going up. It just hit 19,000, which is a new record, and we had the finance minister of India saying publicly that these kinds of levels are insane, and investors should be cautious. I think it’s also the responsibility of a business journalist to project a more responsible attitude. Barroux: In France we have a very specific issue, which is that the French media groups are not that wealthy. Historically, the profit margins have always been very low, and now you have a change in the business model that is eroding the profit margins even more. And in the last few years, many of the newspapers and media organizations have been bought by industrial groups who are making money somewhere else than in the media; they invest in the media and they’re taking over the media. It’s having an impact — we don’t have corruption issues in France, but there might be, in the future, a question of self-censorship. It’s becoming more and more problematic for many media outlets in France to be able to fairly cover a lot of businesses that are either owned by or competing with their owners who have a stake in many, many other industries, and not only the media industry. Knowledge@Wharton: I have one last question for all of you. Please pretend that I am a first year journalism student, and I have come to each of you as if you were my mentors, and I want to know what it’s going to take to be a successful business journalist in the future. What advice would you give me? Jablonski: I would start by offering that you have to remember the heart of journalism is storytelling, and I think one of the ways — especially at Marketplace, where you’re doing a radio program and you have to make a connection fairly early on to keep people tuned in as they’re doing a million other things, be it driving through traffic, or getting dinner on the table — is still giving people the human aspect of stories. CEOs are becoming maybe larger personas because we’re hearing more of who they are. You can talk about a tax cut, but if you can’t show the implication for your listeners, your readers, your audience, it’s not going to stick the way it would otherwise. Essentially, all of this has a human face to it, and it’s always, I suppose, looking for that, which in some cases is a lot easier than others. Perez-Pena: I know it sounds obvious, but read. Read everything. Be endlessly curious. I think a journalist’s job is to be endlessly curious and to know as much about as many things as possible. The metaphor that I always think of is that if you’re building a fabric to catch something that would fall otherwise, you can throw one thread across the gap, and another thread across the gap, and it’s going to take a lot of threads before this is something that’s solid enough that will actually catch what’s trying to fall through. So, just, read. Kannan: Even though the kind of media through which people are getting their information is changing rapidly, I think the inherent nature of that information is not changing all that much. People want something that’s relevant, something they can use…. Basically, I think the fundamentals of journalism won’t change. You still need to ask a lot of questions, ask the right kind of questions, and try to get all the answers. It’s just that you would then post the answers a little differently depending on which medium you were in. Barroux: The way journalism was taught in France was that very quickly you had to decide whether you wanted to be a radio journalist, a TV journalist or a print media journalist, and I think the advice that I would give to a young student today is try to do all three things at the same time. In the future, once you have a good story, the key will be to be able to tell that story in all the media, in any way that they exist — so we will have to be able to be both a TV producer, a radio journalist and a print media reporter in the future. I think that’s the only way that the younger generation will be able to take our jobs much sooner than we expected.